–Friedrich Froebel, founder of kindergarten. Spielgaben 1 is a collection of 6 soft, woolen balls with removable strings. Using the balls provides a child with the opportunity to discover and evaluate different types of movement. Crossbeam, crossbar and pillars also included. The ball is chosen to be presented to the child before introducing any other shape. It is the simplest shape and the one considered the most pure. It is also the shape of the earth. The ball is easy for a child to hold. The wool is soft; there are no small parts to get lost. The balls are the color of the rainbow or the color spectrum. Much like a cat can turn a ball of yarn into hours of fun, a young child can also find delight in a simple, colorful ball of yarn. When collected into a ball, it forms a popular toy for young children. Infants delight in balls because, when made to the right shape, they are easy to hold, and they can be manipulated in multiple ways. Balls can be tossed and rolled around the room (and tossed and rolled back creating a fun game with a parent). Balls can also be moved around in a child’s hand, creating a unique feel and allowing the child to experience the shape. Unlike a simple ball, a ball of yarn adds many different dimensions. Its softness gives it a sensory component, while the individual strands of yarn on the ball add ridges to introduce a different sense. However, it is when the ball of yarn is unraveled that it truly distinguishes itself from an ordinary ball. The string of yarn dangling from a slightly unraveled ball of yarn becomes a lesson in movement. With a parent’s help, infants may work on building their grasp by trying to capture the freed string of yarn or simply sit back and watch the colored yarn wiggle around in mid-air as a parent gently shakes the ball. As the balls of yarn become more unraveled they become a lesson in form, as well as movement. The balls can be combined to create squares, circles, triangles, and a whole host of unique geometric shapes and letters. Toddlers may manipulate the balls into the shapes themselves, marveling at the rainbow of colors that go into each of the shapes. For infants, it is recommend that parents focus on introducing a single color at a time, so as not to overwhelm them, and then gradually mix the colors as they go, starting by mixing color pairs such as red and green or introducing all three primary colors at the same time. With the different colors, toddlers may also begin to use the balls as part of symbolic play, inserting the balls in place of common objects. For example, the red ball may become an apple and the orange ball may become an orange, as kids use them to create their own fun game. Crossbeam, crossbar and pillars can be used to help children see and manipulate the yarn in new ways. These items are particularly useful when introducing color, as parents can hang the balls of yarn from the balls to help children see the colors suspended in sequence, adding and taking away colors as they like. While suspended, children also get a lesson in motion as the balls move and sway. When all hung together they become a makeshift version of a Newton’s cradle. By swinging end ball to hit the other balls, kids can learn how objects react when a force is created and how that force can continue through to different objects in its path. 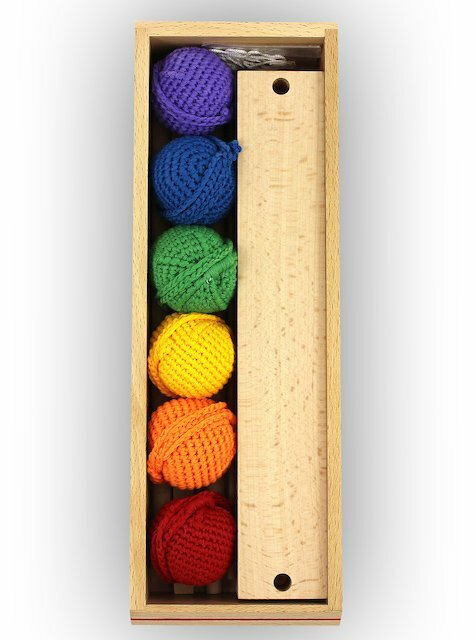 The balls can also be contained in a smaller sort of box, allowing children to take in both the shape, the colors, and how they exist in a particular space.